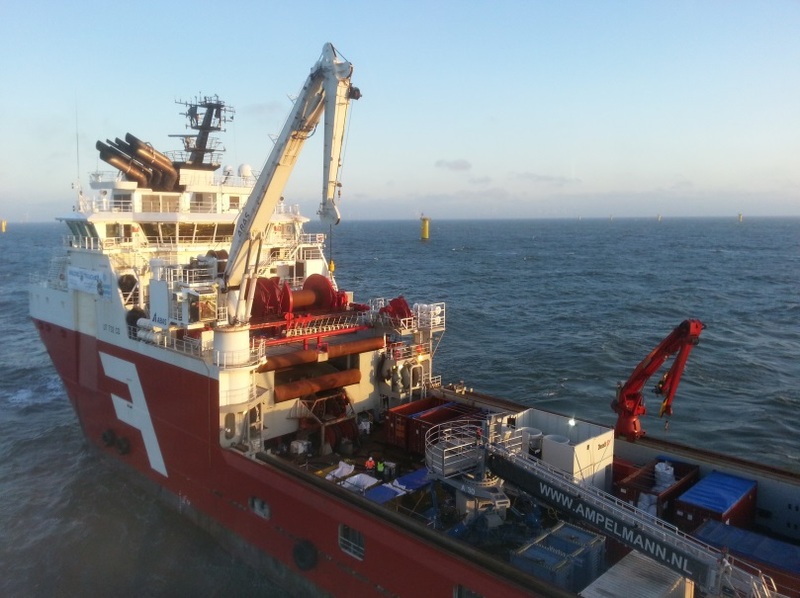 ITW has finished grouting work at Amrumbank offshore wind farm. The connections between transition piece and monopile have been grouted with the cementitious material Ducorit and the installation was completed by highly skilled supervisors. For the Amrumbank project (80 connections) ITW delivered another turnkey grouting solution including Ducorit, their newly developed equipment and with the installation of the product performed by their own supervisors. In 2014 the first 19 connections were grouted while the rest of the 61 connections were completed in the period 19th April to 21th May, 2015 with an average of two grouting operations per day. The installation of the monopiles and transition pieces was performed from the jack-up crane vessel MPI Discovery and the grouting part executed from Far Sapphire, a DP2 grouting vessel equipped with an Ampelmann system. The execution of the foundation installation and the grouting operation from two separate vessels is still relatively uncommon, but ITW is experienced in this method of grouting. “We do not prefer one solution rather than the other but at this project it has really worked out well”, says Soren Munk, ITW Supervisor and he continues, “The setup allowed us to work very intensively for a shorter period”. Besides being able to deliver its performance grout, ITW delivers a turnkey grouting solution including for example: project management, planning, newly developed equipment, highly skilled supervisors to perform the installation, as well as test sampling and documentation. According to the company, 70 % of all offshore wind turbines in Europe contain Ducorit grout as a crucial element.